Hamas leader unfazed after being blacklisted by U.S. Treasury. 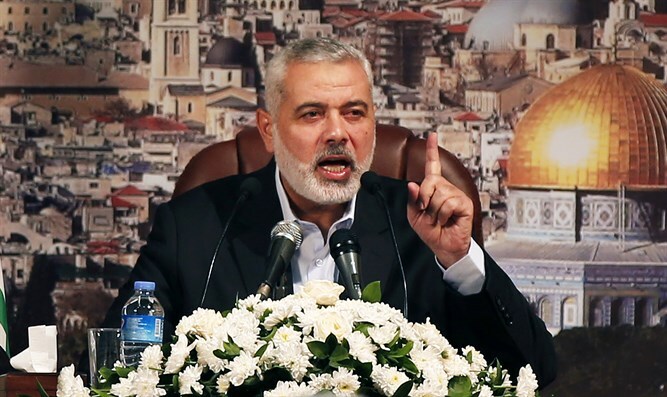 Hamas leader Ismail Haniyeh on Thursday was unfazed by the U.S. Treasury Department’s decision to add him to the list of global terrorists sanctioned by the U.S. The remarks were the first time that Haniyeh spoke in his voice about the American decision, which freezes all assets in the U.S. owned by him and bars American citizens from doing business with him. International organizations which operate in the U.S. may also be held liable for business dealings with Haniyeh. On Wednesday, hours after the Treasury Department's announcement, Hamas issued a statement in which it denounced the decision, and vowed that it would “not deter” the organization from continuing its terrorist activities. "The American decision to include Haniyeh on the terrorist list is a failed attempt to pressure the resistance," a Hamas spokesman said. On Thursday, Haniyeh received the backing of senior Fatah official Saeb Erekat. In a post on the Fatah party’s official Facebook page, Erekat “rejected and denounced” the U.S. for its decision to sanction the Hamas leader, and called for “the achievement of national unity in order to preserve the Palestinian National project”. “The Palestine Liberation Organization rejects and denounces the decision of the United states Treasury Department to include Ismail Haniyeh on the terror blacklist,” the post reads.